Think about the last time you swallowed – you didn’t force yourself to do it – it just happened. Swallowing is a complex task that requires both voluntary and involuntary contractions to move food from the mouth to the stomach. As Alzheimer’s disease progresses, the brain loses its ability to process certain commands (such as chewing and swallowing), increasing the risk of choking, pneumonia and even death. It’s important to remember that no matter how closely we watch our loved ones, the hazards of choking are always present. The brain is made up of several parts, each with its own function. According to the Mayo Clinic, there are nearly 50 pairs of muscles and many nerves that work together to complete the swallowing process. Difficulty chewing and swallowing food properly. All of these difficulties can lead to serious complications (choking, pneumonia, and death). Tip #1. Monitor your patient or loved one closely during mealtime. Tip #2. Cut foods into smaller pieces to avoid choking. Tip #3. Consider serving finger foods that are easy to chew. Tip #4. Try serving six smaller meals per day as opposed to three larger meals that may take more energy to consume. Tip #5. If serving meat, remove the meat from the bone and remove any non-edible items from the plate. Tip #6. Serve only one course at a time to limit distractions. Tip #7. Keep your loved one or patient in an upright position for 30 minutes after any meal. Tip #8. Make sure your loved one or patient is well rested before each meal. A well-rested person is less likely to have difficulty swallowing. Tip #9. Limit distractions while eating by removing extra place settings, centerpieces, etc. Tip #10. Stop using foam cups and paper napkins, which may be mistakenly eaten. Tip #11. 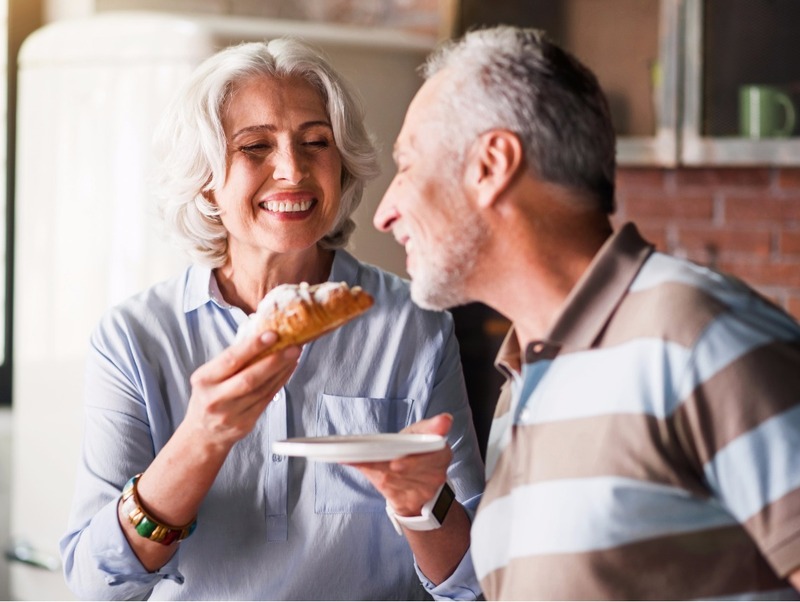 If necessary, assist your loved one in holding utensils properly and guide the utensil to their mouth. Tip #12. If your loved one has difficulty swallowing solid foods, consider blending foods into a liquid state. Tip #13. Avoid rushed or forced eating. Take your time and move slowly. Tip #14. Be sure your loved one is well hydrated – offer fruits, soups, and smoothies. Tip #15. Always be prepared in the case of an emergency, understanding what to do if your loved one begins to choke. Caring for someone with Alzheimer’s disease can be overwhelming at times, and the team at Sonas Home Health Care is here to help. We refer loving and knowledgeable caregivers to provide expert Alzheimer’s care – from respite services to around-the-clock care. Give us a call at (888) 592-5855 or visit us online to Request a Free In-Home Assessment.